This box set was hands down the most sought after record on my Record Store Day list this year. In fact, its release was what pushed me into driving down to Vintage Vinyl so far in advance. Until it was announced, I only had passing interest in most of the Record Store Day titles and figured I could just grab them whenever. Leatherface made participation mandatory. Leatherface is one of the three most influential bands I've ever listened to, their impact on my taste in music simply cannot be overstated. Their albums are long out of print on vinyl and it took a long time for me to track them all down. Granted, I locked down that collection quite a long time ago at this point, but you should have seen some of the wacky record stores in England I ended up digging through in the late 90's. The Razor Blades And Aspirin box set was limited to 1500 copies overall; 500 in the US and 1000 in the UK. I was lucky that a nice guy from Utah picked up a copy for me and sent it over at cost. I only had to pay for the shipping. Prior to that, I was freaking out a little bit, concerned I wouldn't get this record. Luckily everything worked out. 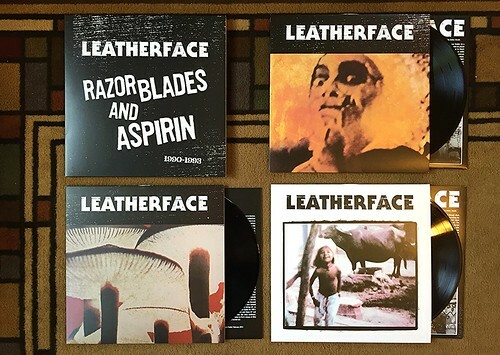 The box set contains the three middle Leatherface LPs of their first run, arguably their creative peak. It's missing their first album, Cherry Knowle, and their 1994 swan song, The Last, but that's not too surprising as Rouchneck/Fire didn't put them out originally. All three albums are remastered and there is a download card with a bunch of B-sides and extras. There's also lengthy liner notes written by Jack Rabid that are a fascinating read. He really should write an entire book about the band. The Fill Your Boots reissue sounds really good. This was the first great Leatherface record. While Cherry Knowle has its moments, Fill Your Boots is the first time the band truly showed what they were capable of. The songs as a whole are a little faster and more straightforward than they would be as the band progressed, but their are several untouchable songs on here. Fill Your Boots is a short eight song record and it feels like it flies by. Compared to the original pressing, this reissue is just as good. Maybe a little louder, but I don't see much of a difference as far as the remastering goes. Mush is Leatherface's absolute classic. You could argue that it is the most perfect puck rock record ever written. It's angry and ferocious, but dynamic and full of hooks. Lyrically intelligent and sonically belligerent. This is one of my three favorite records of all time and an album I encourage everyone to go out of their way to hear. The first song, "I Want The Moon" could be the best side one, track one of all time. Really its only competition is "Here Come The Rome Plows" by Drive Like Jehu. The box set reissue sounds pretty good. It's miles better than the bootleg reissue that began popping up a few years ago. But I played the original pressing right after the reissue and to me the original still sounds brighter, more clear and louder. The reissue is very, very good, but there's something about that first pressing that keeps it a notch above. Minx rounds out the full length albums in this set. The production on this album was never quite as pristine as Mush, but the songs were always equally great. In fact, my very favorite Leatherface song, "Do The Right Thing" is from this album. For this album, the new reissue sounds a little cleaner than the original pressing, though the difference is subtle at best. Unlike Mush, this version is a totally acceptable replacement for having the original. The box set also comes with a digital downloaded containing a bunch of B-sides, acoustic versions and the entire Smokey Joe and Compact And Bijou EPs. There are some amazing songs on here, though there isn't anything previously unreleased if you'd been hunting down their singles. For this to be the definitive boxset, there should have been two more LPs with all of these B-sides. I do get frustrated by download only extra tracks, but at least Fire did get them out there in some way. I also don't really like the redone artwork of the individual album covers. I'm not losing any sleep over it, but I like the originals better. Considering how long the original pressings of these records have been out of print, it's great news that they're finally back. I'm curious if this will remain a one off pressing for Record Store Day or if Fire will try to keep some version of it in print going forward. While maybe not the most popular band of all time, you'd think Leatherface has enough of a following to justify keeping these records out there. If you don't have the originals, this box set is absolutely essential. If you do have the originals, it still might be worth picking up. Fill Your Boots and Minx sound equally good, if not a touch better than the originals, but the Mush reissue falls a bit short. One way or another, everyone should own these records.